As if it wasn't already hard enough for physicians to provide care and get paid by Medicare, many physicians and their staffs are now documenting and reporting data to demonstrate "meaningful use" of electronic health record (EHR) systems, quality (for the Physician Quality Reporting System(www.cms.gov), or PQRS, formerly PQRI), successful e-prescribing and more. 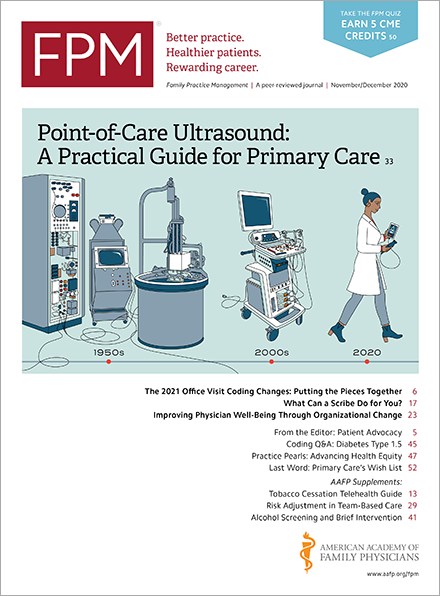 The seeming (and sometimes glaring) lack of coordination across these programs has created barriers to successful participation that may actually detract from the intended increases in quality and coordination of care. I hope I have stumbled onto something that might help family physicians and their staff members who are considering how to report the required measures while still having the time and sanity to provide patient care. In developing information on the new Medicare annual wellness visit and the documentation necessary to be paid for that newly covered benefit, I researched the extent to which documentation of preventive services might also be used to support both the PQRS and the meaningful use reporting requirements. The following table identifies areas of overlap and notes regarding the frequency with which Medicare will pay for the preventive services. Of course each of the programs has its own measure specifications and reporting methodologies, so it may provide much relief to use one measure to meet multiple reporting requirements. However, the table might help you to better organize your efforts. For instance, is your EHR approved by CMS(www.cms.gov) for use in reporting data to the PQRS program? If not, have you considered using a registry(aafp.pqriwizard.com) for this purpose? If you are providing annual wellness visits or otherwise documenting your patients' preventive care, registry-based reporting, which requires reporting data for only 30 Medicare patients, might be more easily accomplished. Do you have other ideas for participating in these initiatives with the least amount of administrative burden? If so, I hope you'll share your comments below. Others will appreciate your help.